In addition to the fireside chat, A Glimpse Into The Future of Game Monetization, with DeNA’s Barry Dorf, Fyber also hosted a panel at GDC15 discussing how mobile advertising can be used to benefit game developers beyond the day-to-day dollar and become part of their overall strategy. Fyber’s VP Developer Relations, David Diaz, moderated the conversation between thought leaders from Sunstorm Games, Ninja Kiwi, Hothead Games, and PikPok. A common challenge for mid-tier game developers that sit in the space between AAA and indie is balancing the risk-versus-reward ratio of including IPs within their games. According to San Francisco based consulting firm Digi-Capital, the issue is that “mid-tier games companies have no hit IPs yet, no scale advantages, but infrastructure and marketing costs.” Due to their general lack of IPs, surpassing the mobile top 100 becomes a real challenge for mid-tiers that are trying to make a name for themselves. PikPok’s Mario Wynands shared that he initially came from a console background and that they experienced similar challenges there. “It’s hard to be nimble in this space. To be successful it’s important to have organic growth and it’s more important than ever to create really solid games.” While it’s more difficult for mid-tier developers to break-through with an IP, Ninja Kiwi’s Scott Walker said “it’s by no means impossible”, as his team created a smash hit with their title, Bloons. Walker emphasizes that “it’s important to have a variety of strategies under your belt. You don’t need to do what the ‘big guys’ are doing if you don’t have the resources to scale in that particular way.” The panel agreed that all games are different and some strategies are more successful than others based on the game vertical and target audience. Due to these inherent differences, it’s important to implement a certain amount of trial and error to perfect your monetization strategy. For example, Sunstorm Games’ Reid Sheppard recalled that when they first sought to monetize their games, which are targeted towards a younger audience, they initially “tried video interstitials, and kids hated it. We got really bad reviews, so we removed them and instead moved to deep integrations of rewarded video content.” For developers, the top priority is high-quality game play, but in order to ‘keep the lights on’, ads are a necessary tactic for mid-tier developers. 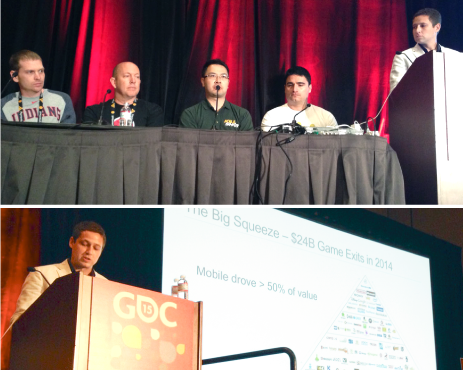 Reid continued by stating that in his experience, “most people are not going to spend real money, so advertising is a real part of the business.” While some devs fear that ads could cannibalize IAP (in-app purchase) revenues, the panelists were in agreement that higher revenues are generated when ads and IAP are implemented hand-in-hand. Hothead Games’ Kenneth Wong emphasized that devs shouldn’t be afraid that including ads will hurt their game and that it’s important to “have faith in your game. We see as much as 10x ARPU with players who engage with ads, versus players who do not.” Wong also believes that it’s possible to create more engaging games through the use of advertising, and that ads should not be seen as an obstacle to great game play.